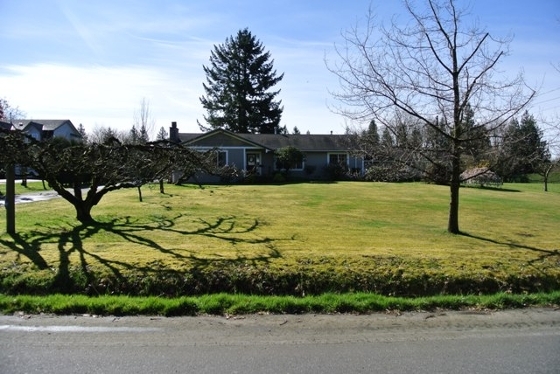 10 Acres in the heart of Bradner. This gem is tucked away on a quiet, no-thru street and is flat, bright, fully useable with southern exposure. There is approximately one acre in gulley and creek that sports a drive-able bridge to access the back 4 acres. Land is certified organic currently used for hay, blueberries, raspberries and grapes. The rancher style home has been extensively renovated and has a bright, beautiful open kitchen, two gas fireplaces, 2 bedrooms (the house could easily convert to 4), 2 bathrooms and lots of space to play. There are numerous outbuildings including a fully finished office with water hook ups, an updated 20 x 50 shop with wood and electric heat, water hook ups, 3 separate bays with space for 5 vehicles; shop is clean, tidy and ready to store all your toys. An equipment storage shed, a greenhouse and a lean-to for farm implements. This property has been meticulously maintained, includes 200Amp service and is walking distance to Bradner Elementary.